This is a sample itinerary for our Private Barcelona Chauffeured Tour. Your private Barcelona highlights tour starts driving around the Montjuïc Hill to see the City views from a vantage point, then drive past the 1992 Olympic facilities and the Stadium, and continue through the 1929 World Fair & Plaça Espanya. Next we’ll head to the Gothic Quarter to stroll around the medieval plazas and backstreet where hide Roman ruins and Gothic patios. We’ll also see the Royal Palace, the City Council and the Generalitat Government building. Our main stop there will be the Barcelona Cathedral, a basilica from the Middle Ages with a historical the wooden choir, beautiful side chapels, the tomb of St. Eulàlia and a cloister where gees have lived for centuries. Or if you prefer, we can take you instead to the Call, the medieval Jewish Section, where one of the oldest synagogues in Europe is located. 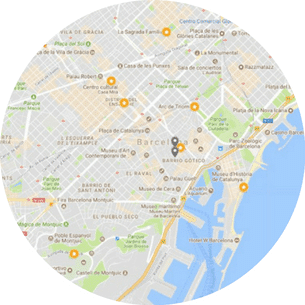 Your Barcelona highlights tour continues with a drive along Eixample District / Passeig de Gràcia. The Expansion is the area where the local Art Nouveau or Modernism was developed between the late 1800s and early 1900s. We’ll explore Ildefons Cerdà’s city plan and we’ll learn about the 3 best architects of the time at the Block of Disagreement: Domènech i Muntaner, Puig i Cadafalch, and of course, Antoni Gaudí. Outside view of Casa Batlló and Casa Milà/Pedrera. Next we’ll head to the impressive Sagrada Família Church, where you’ll skip the line with your Barcelona tour guide to get in. Gaudi worked in this project for 43 years until he died in 1926. Although ten more towers are still missing, the inside has been already consacrated and the rest is planned to be finished around 2026-30. A place you’ll never forget! The last part of your private Barcelona highlights tour will be a light drive around the city to see the area of the 1888 World Fair, passing by the Ciutadella Park and the Arch of Triumph, to reach the Waterfront where we’ll see the Olympic village and the marina, the beaches, the Barceloneta fishermen district, the Port Vell (Old Port) and Columbus circle. At the end of the tour, you’ll be dropped off back to your hotel, apartment or pier, or at some restaurant for lunch.